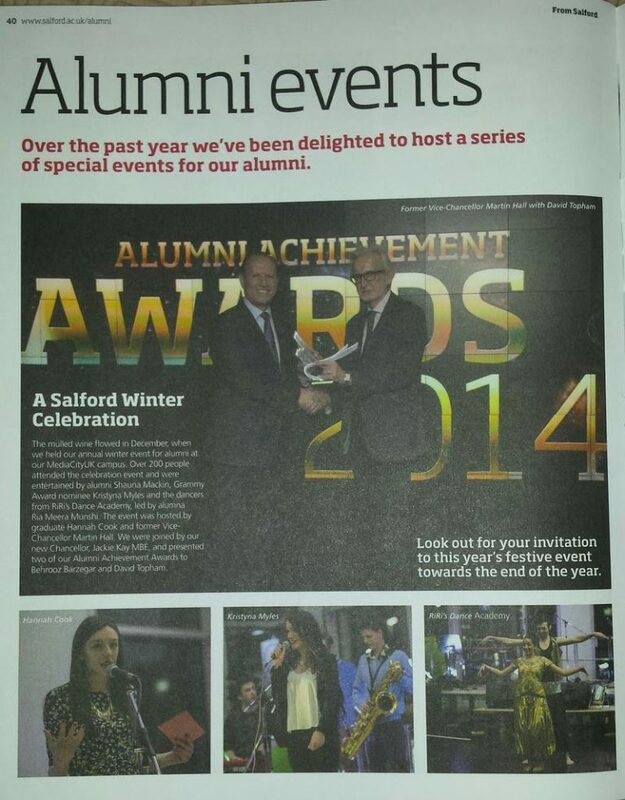 With such diverse and incredible achievements, throughout the Alumni community of The University of Salford, the annual Salford Winter Celebration Alumni Achievement Awards, held each year at Christmas time, recognises those high and outstanding accomplishments. The Fusion Dance Group from Ri Ri’s Dance Academy were called upon to provide premier entertainment for this prestigious Event. They shared the stage alongside a number of other successful Alumni, like Ria Meera Munshi, such as professional Comedian and Magician Barrington Powell. Enthralling the Alumni audience was six of Ri Ri’s dancers, forming a fusion dance group. With both male and female dancers taking to the stage, the guests of the evening were transfixed with the vast amount of energy, complex choreography, spectrum of styles and, of course, the stunning costumes! The performance executed by the Manchester based Academy captured a blend of Western and Asian cultures, conventional dance forms like Ballet, Break Dancing and Bollywood and the dancers themselves were all disparate, yet bound together in unison, as a group, by the beautiful art form of dance and tremendous talent. To make this piece of entertainment even more special was the fact that three of the dancers from Ri Ri’s Dance Academy were current students or graduates of The University Of Salford – Adding a personal touch the Salford Winter Celebration Alumni Achievement Awards, in 2014.